Simple, effective, a great tool when your opponent is heavily committing to a story hoping to be unopposed or to secure the skill check. Obviously a hit or miss against mythos decks, it will do wonders on Misk rush or Syndicate as long as clover club pit boss isn't out. Driving 1 character insane of itself is usually a waste. Driving 2 insane is ok, but not good. Driving three or more insane will usually be good value. But that isn't where this gem shines. The secret to this card is in decks with at least a moderate number of skull icons, and perhaps relatively few terror icons. 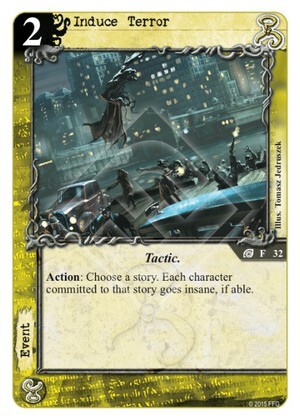 For terror, remember, using this invalidates a terror win at that story, since characters able to go insane will already be insane, so there is a mild anti-synergy with terror heavy decks. For combats tho, having some of the guys at a stories go away is an excellent opportunity for an unexpected Combat struggle wins, and thus you get to kill one of their precious willpower guys. So correct use of this card is most often in story defense, or sometimes careful trap offense or in response to opponent Tactic cards. But a key point is use is to make sure you not only drive some guy(s) insane, but also get to kill something and/or save something, so card advantage is in your favor not theirs. Minor Note: this db entry has a capitalization error, a small "i" thus "induce Terror", not the correct "Induce Terror".